This code is a reimplementation of the guided policy search algorithm and LQG-based trajectory optimization, meant to help others understand, reuse, and build upon existing work. 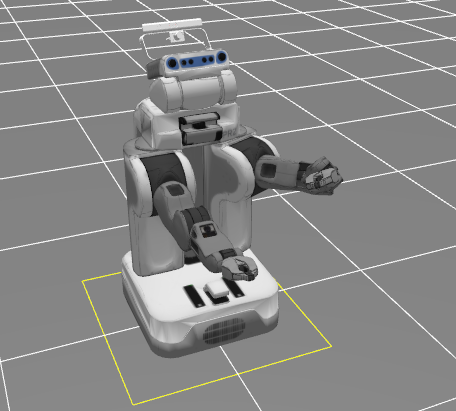 It includes a complete robot controller and sensor interface for the PR2 robot via ROS, and an interface for simulated agents in Box2D and MuJoCo. Source code is available on GitHub. While the core functionality is fully implemented and tested, the codebase is a work in progress. See the FAQ for information on planned future additions to the code. Chelsea Finn, Marvin Zhang, Justin Fu, William Montgomery, Xin Yu Tan, Zoe McCarthy, Bradly Stadie, Emily Scharff, Sergey Levine. Guided Policy Search Code Implementation. 2016. Software available from rll.berkeley.edu/gps. For bibtex, see this page. One or more of the following agent interfaces is required. Set up instructions for each are below. TensorFlow (Tested on versions 0.5-0.8. Works with and without GPU support). Set up one or more agents below. 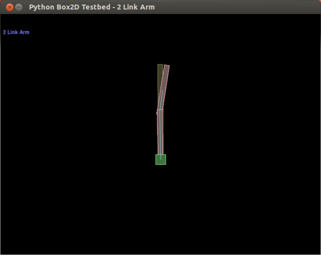 Here are the instructions for setting up Pybox2D. In addition to the dependencies listed above, OpenSceneGraph(v3.0.1+) is also needed. It can be installed by running sudo apt-get install openscenegraph libopenscenegraph-dev. Install MuJoCo (v1.22+) and place the downloaded mjpro directory into gps/src/3rdparty. 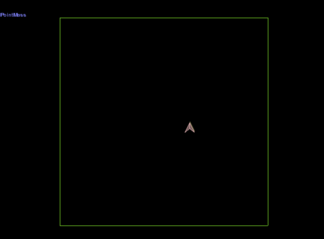 MuJoCo is a high-quality physics engine and requires requires a license. Obtain a key, which should be named mjkey.txt, and place the key into the mjpro directory. Don’t forget to run source ~/.bashrc afterward. This is required if you intend to run neural network policies with the ROS agent. Run step 1 and 2 of the above section. Checkout and build caffe, including running make -j && make distribute within caffe. To compile with GPU, also include the option -DUSE_CAFFE_GPU=1. 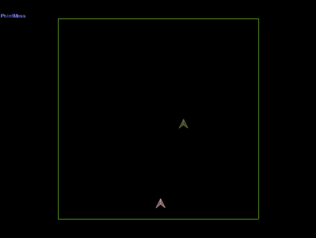 There are two examples of running trajectory optimizaiton using a simple 2D agent in Box2D. Before proceeding, be sure to set up Box2D. Each example starts from a random controller and learns through experience to minimize cost. The first is a point mass learning to move to goal position. The progress of the algorithm is displayed on the GUI. The point mass should start reaching the visualized goal by around the 4th iteration. 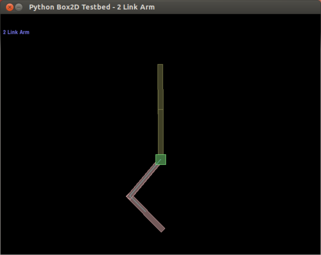 The second example is a 2-link arm learning to move to goal state. 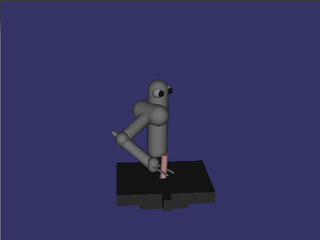 The arm should start reaching the visualized goal after around 6 iterations. All settings for these examples are located in experiments/box2d_[name]_example/hyperparams.py, which can be modified to input different target positions and change various hyperparameters of the algorihtm. To run the mujoco example, be sure to first set up MuJoCo. 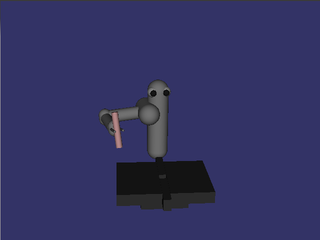 Here the robot starts with a random initial controller and learns to insert the peg into the hole. The progress of the algorithm is displayed on the GUI. The robot learns a neural network policy for inserting the peg under varying initial conditions. To tinker with the hyperparameters and input, take a look at experiments/mjc_badmm_example/hyperparams.py. Additionally, the neural network library can be changed through the ALGORITHM_NN_LIBRARY variable which can be set to caffe or tf. To run the code on a real or simulated PR2, be sure to first follow the instructions above for ROS setup. This will stop the default arm controllers and spawn the GPSPR2Plugin. Note: If you are running ROS hydro or later, open the launch file pr2_gazebo_no_controller.launch and change the include line as specified. Now you’re ready to run the examples via gps_main. This can be done on any machine as long as the ROS environment variables are set appropriately. 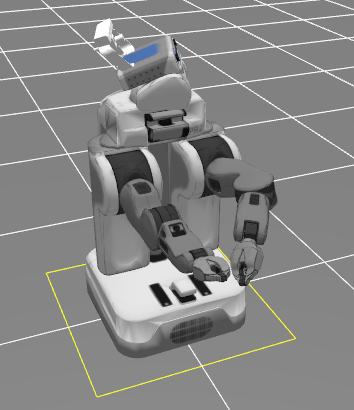 The first example starts from a random initial controller and learns to move the gripper to a specified location. The PR2 should reach the position shown on the right below, and reach a cost of around -600 before the end of 10 iterations. This will create a new directory called my_experiment/ in the experiments directory, with a blank hyperparams.py file. Fill in a hyperparams.py file in your experiment. See pr2_example and mjc_example for examples. See the GUI documentation for details on using the GUI. All of the output logs and data will be routed to your experiment directory. For more details, see intended usage. The code was written to be modular, to make it easy to hook up your own robot. To do so, either use one of the existing agent interfaces (e.g. AgentROS), or write your own. You can post questions on gps-help. If you want to contribute, please post on gps-dev. When your contribution is ready, make a pull request on GitHub. This codebase is released under the BSD 2-clause license. If you plan to use this code for commercial purposes, we ask that you send us a quick email at gps-dev-private@googlegroups.com to let us know that you’re using it. © Copyright 2015, Chelsea Finn, Marvin Zhang, Justin Fu, Zoe McCarthy, Xin Yu Tan, Emily Scharff, Sergey Levine.